The management and staff of the Malia Beach Hotel, being aware of the importance of environmental protection in order to develop a sustainable tourism market, have established an environmental policy to declare the principle they support in this matter. 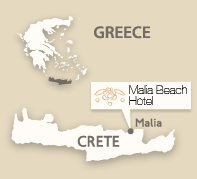 The Malia Beach Hotel commits itself to follow this policy in order to help protecting the environment. • Aim for continuous improvement through the establishment of goals. • Informs its hotel guests about environmental actions carried out by the hotel, in order to encourage their active participation.